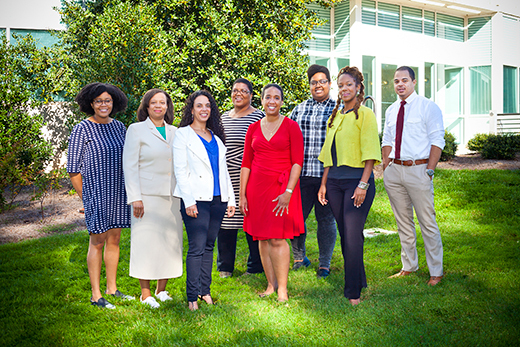 The staff of the revitalized James Weldon Johnson Institute includes (left to right) Danielle Wiggins, graduate research assistant; Anita Spencer Stevens, program administrative assistant; Michelle Gordon, visiting fellow; Nikki Brown, visiting fellow; Andra Gillespie, JWJI director; Taryn Jordan, graduate research assistant; Kali-Ahset Amen, JWJI assistant director; Carl Suddler, visiting fellow. Supported by a grant from the Andrew W. Mellon Foundation, the program provides three fellowships for both junior and senior scholars to be in residence at the institute for one academic year. Fellows teach one undergraduate or graduate course and participate in the Race and Difference Colloquium Series. Nikki Brown — An associate professor of history at the University of New Orleans, her research includes themes of gender, race, identity, representation and politics. She is currently working on a book about the photographic history of Louisiana's Civil Rights Movement. Carl Suddler — After earning his Ph.D. in history from Indiana University, Suddler has focused his research on examining constructions of youth, race and crime in the twentieth century United States — specifically, how the justice systems and their associated authorities contributed to racialized constructions of youth criminality, primarily in the urban North. Michelle Gordon —After earning her PhD in English from the University of Wisconsin – Madison, Gordon went on to serve as assistant professor of English at the University of Southern California in Los Angeles. Her scholarship has focused on 19th and 20th century American literature and print culture; her current project explores a radical literary and cultural history of black Chicago, from the Great Depression through the rise of the Black Power era. Emory's James Weldon Johnson Institute for the Study of Race and Difference is ushering in a new era of leadership. Now under the direction of Andra Gillespie, associate professor of political science at Emory University, and assistant director Kali-Ahset Amen, the institute has relaunched this year with an energized vision and amplified social science focus. Support scholarship and public engagement that examines race and intersecting dimensions of human difference, including class, gender, religion and sexuality. Foster dialogue on the significance of race and ethnicity in American life and culture. Engage social science and humanities scholars of the African American, Asian American and Latino/Latina American experiences. That mission is important to Gillespie, whose own research focuses primarily on African American politics, political participation and leadership. She's eager to see the institute become a research hub for scholars representing an array of disciplines from across the university — and beyond. "I like to build things," says Gillespie. "So I've very excited about the prospect of being able to shape an institute. My goal is to help contribute to Emory's reputation as a leading center for scholarship on race in the United States." Atlanta has too many natural resources "for Emory to not leverage those advantages to harness the possibilities for fascinating scholarship," Gillespie explains. "We should be a place where professors want to teach on race and difference because Atlanta is their laboratory, where students want to study issues of race and difference," she says. "Given Atlanta's history in the civil rights struggle in the U.S. and its importance to that historical narrative, Atlanta has to have an institution that embodies what scholarship on race and difference looks like," she says. "I think Emory can be that place." The James Weldon Johnson Institute was founded by the late professor Rudolph Byrd, an acclaimed literary scholar and former director of Emory's African American Studies Program — a fact that serves both as a personal inspiration and challenge for Gillespie, who considered Byrd a friend and mentor. "My goal is to honor his legacy by making sure this institute sustains itself — that it not only lives, but thrives," she says. "There are definitely ways in which we hope to continue his vision. The structure, the fellowship program — those things will continue." But there are also ways that Gillespie will seek to expand Byrd's vision. "We want the James Weldon Johnson Institute and our website to be a hub and repository for interesting data on race — a publicly embraced site where scholars can download and search for data, check a digital archive, or even link to the Rose Library," she explains. Given the national dialogue around race and difference that has been ignited in the United States in recent years, there couldn't be a more important time to strengthen the institute's role in nurturing new knowledge, adds Amen, a political sociologist. "The James Weldon Johnson Institute is reviving itself at a really crucial moment," she says. "We're really trying to cultivate an inclusive and more welcoming space about race." "In previous years, a lot of the scholarship here was very grounded in the humanities," she says. "We're now seeking to give support as well to social science scholarship and the professional disciplines, to reach out across the College of Arts and Sciences to engage our colleagues in the School of Public Health, School of Nursing and the School of Medicine." "It's important to have those voices at the table," she adds. If Gillespie has an overall goal it's to increase intellectual dialogue — between the campus and larger community, between outside scholars and Emory faculty, between disciplines. "It was very important to Rudolph that the work the institute did would be relevant and accessible to the community," explains Gillespie. "This is a place where we can talk about race broadly," she says. "We're talking about Latinos, we're talking about Asian-Americans. We want scholars to talk about issues like immigration. Scholarship has to be our primary focus, but our events and activities are open to everyone." "Race, Politics, and Citizenship: The Voting Rights Act at 50" — A public roundtable will explore the impact and challenges facing the U.S. Voting Rights Act 50 years after its passage. Tuesday, Nov. 10, from 4-5:30 p.m., Oxford Road Auditorium. "Race, Policing, and Social Justice, from Baltimore to Ferguson and Beyond: A Biennial Review" — A public panel discussion will examine the year's events in Ferguson, Baltimore and Charleston, highlighting how interdisciplinary political science can help frame issues raised by the Black Lives Matter movement. Thursday, Dec. 3, from 4-5:30 p.m., Winship Ballroom. The institute is also actively planning spring events, including a symposium on the relationship between Southern and African American history and a keynote lecture on the scholarly significance of educator and civil rights leader W.E.B. Du Bois. Ask Gillespie what excites her about her new role and she quickly describes "the possibilities of being able to create something new and lasting, creating a place where race can be studied, to find additional ways to study race that are nationally relevant." "To see us become a clearinghouse for research on race, a place where you can go to find and download information in a way that can be responsive to relevant breaking news," she says. "That excites me.